The reverse design, by United States Mint sculptor John Mercanti, features a striking heraldic eagle with shield, and olive branch in the right talon and arrows in the left. 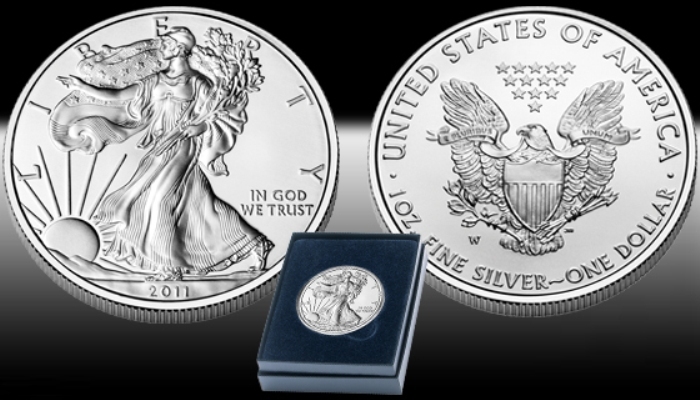 The 2011-W American Eagle Silver Uncirculated Coin is encapsulated in plastic, placed in a protective outer box, and accompanied by a custom-designed Certificate of Authenticity. The release of the 2011 burnished silver eagle was a pleasant surprise to collectors who suffered through a 3-year hiatus of this series. The 2008 burnished silver eagle was unexpectedly discontinued in late 2008 by the US Mint and never returned. The Mint explained that it was directing available blank silver planchets for the production of the bullion silver eagle coin program instead, which it is required by law to strike to meet demand. That demand was at record levels owing to the uncertain economy of the time and continued throughout 2009 and 2010. As a direct result, no 2009 or 2010 dated burnished silver eagles were produced at all. The return of the burnished silver eagle is great news to coin collectors and dealers alike! We have no idea how long these coins will be available so please order now to prevent disappointment. Copyright © 2011, Silver Eagle Coin Company. All rights reserved.